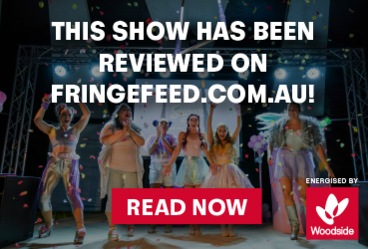 Feminah is a cabaret piece about the vulgar women of the world; the women that embrace all things trashy and beastly and that celebrate their intrinsically hideous selves. It is a power ballad for women too scared to unleash the beast within and let her wreak havoc. Feminah follows one woman on a war-path to dismantle every structure set in place to keep her calm and appropriate; she's here to destroy the town, and maybe take you with it. A solo show created by Perth's staunchly seductive powerhouse Charlotte Otton, Feminah is an ode to women that censor themselves for the sake of being professional, tasteful or -- heaven forbid -- cute. This explosion of gritty femininity is what happens when a woman refuses the idea of 'having it all' and instead, annihilates it. Charlotte Otton is an emerging theatre maker and recent graduate from the Performance Making course at WAAPA in 2017. A multidisciplinary artist, Charlotte studied improvisation in Chicago and New York (iO and Second City, 2015) and is a current ensemble member of The Big Hoo-Haa. She has recently finished an Artist in Residence at Fremantle Arts Centre with ‘Let me finish.’; a new work that will be seen by Perth audiences in 2018. She has completed internships with The Blue Room Theatre (2017) and Perth Festival (2017/2018). Recently, Charlotte has finished a season at The Blue Room Theatre performing in Hive Mind and performed in a co-production with WASO and Spare Parts Puppet Theatre with The Carnival of The Animals.